I know just enough about music to NOT play the piano well. I can read music fast enough to produce the melody of a song leaving out notes making the music sound empty. I consider myself musically reckless! I feel a little "under the gun" writing this particular article today with my daughter being a music educator. Alas, I hope you enjoy this brief music lesson. There are four types of music chords; major, minor, augmented and diminished. I want to talk about the first two, major and minor. Major means greater. Minor means lesser. Chord structure sets the tone of a song. For example, major chords produce generally happy sounding songs while minor chords are used to create a dark or sinister mood in a song. Then, there's timing which also plays an important role in a song's personality. I'll not go there because I can see Sloane shaking her head and nervously screaming "NO!!". My timing is brutally off, all wrong according to music theory and Sloane! Hark the Herald Angels Sing is written in a major chord. The song is upbeat and happy.God Rest Ye Merry Gentlemen is written in a minor chord. The song is serious with an almost unhappy sound. You can hear immediately the vast difference between major and minor chord structure in these popular Christmas carols. Consider this music knowledge and examine your heart this Christmas. 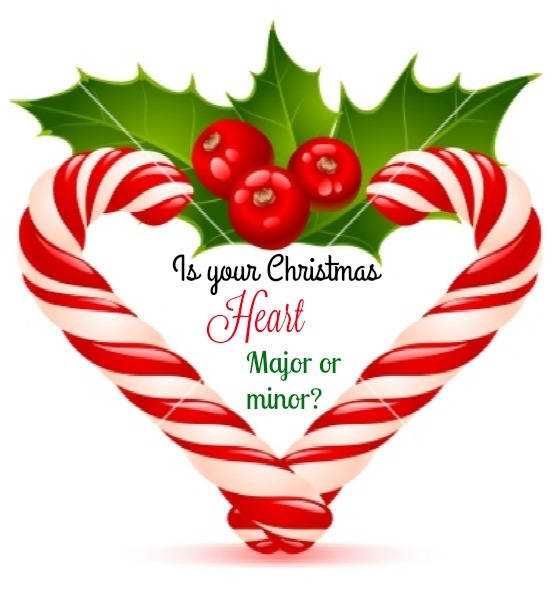 Is your heart singing a major tune, happy and joyous or is it moaning a minor song with despair and darkness? Your heart song matters. People can almost instantly know the condition of your heart by the words that flow from your mouth, thus, the song you sing. Philippians 2:2 Fulfil ye my joy, that ye be likeminded, having the same love, being of one accord (a chord), of one mind. See, you know more about music than you thought. Chords hold major importance on our most minor days!